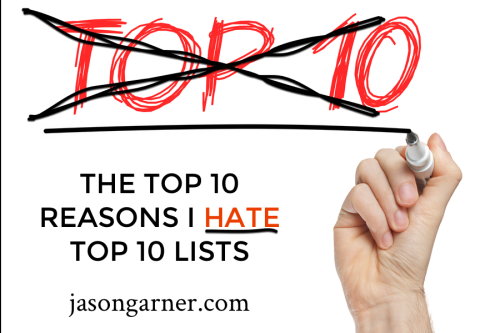 I really hate top 10 lists, and my team has been pushing me to write one. “People love them,” they say. “Top 10 lists get the highest click-throughs,” they explain. “Just try one, you’ll see,” they prod. So here’s mine. I don’t think it’s quite what my team had in mind when they pestered me to write one. But in case you haven’t noticed, I don’t really like doing what’s expected of me. 1. They rarely work. Their headlines look great. How could anyone resist? Ten guaranteed steps to success at something-or-other; of course I’ll click on it, right? But then what happens? I read someone else’s simplification of their life and when I try to apply it to mine it doesn’t work … and I feel worse than when I started. 2. They don’t honor the experience of life. We are all doing our best. We are all trying to be happy in the best way we know how. If fixing all our hurdles was as easy as reading a list we would all be saints by now. But it’s not. And so, in making the claim that it’s “easy” or “simple,” the lists fail to honor the very real challenges we face and the courage it takes to face them. 3. They are condescending. These lists represent someone’s journey, and that’s great. But that doesn’t mean they represent mine, or yours, or anyone else’s for that matter. So when some “expert” whose expertise comes from having lived their life stands on a soapbox and lectures about how easy it all is, it’s condescending and arrogant. 4. They miss the one true rule. The one rule I have learned over and over in my life is that self-love is the only true remedy for the pain we experience in life. Honestly, there has not been one bit of heady, intellectual advice that has healed my wounds like learning to love myself. And that learning came from living from my heart, not reading a list. 5. The writers sidestep their true emotion by composing a list. It’s easy to make a list. Why? Because it requires very little emotional connection. What’s difficult, what makes us grow, and what we really need is more teachers who, with their hearts, share from a vulnerable place that connects with us. There’s nothing like a teacher sharing a very real life experience to show us that we’re in this together. Lists are not experiences, they’re gimmicks. 6. They make me feel worse. There is nothing worse than a know-it-all when we’re experiencing pain. You know the friend … we all have one, or two, or too many. The ones who walk into your experience and say, “Just do this and this and this and everything will be okay” and then pat us on the back and move on to something else. Healing comes from hugs not heady advice. And the know-it-alls only make us feel worse because on top of our pain they make us feel dumb. 7. They contradict each other. There are so many of these lists out there that they now contradict each other. Like the Top 10 Ways to Lose Weight that clog my twitter newsfeeds – vegan, paleo, low carb, low fat, high fat, high protein, no meat, and the lists go on … and on … and on. It’s as if all the experts make lists just to trump the other experts’ lists and the result is confusion and contradicting advice that only makes life more challenging. 8. They take up space that could be used for honest conversation. Every generic 10-step list that gets published is occupying space that could be used, and should be used in my opinion, for an honest, heartfelt dialogue about our human experience. This does us all a disservice and, in the end, means that someone who truly needs a warm hug, an “I love you,” or a bit of heart connection misses out. 9. They tell us that we aren’t good enough. All of these lists start from the point of view that we are broken, flawed, and not good enough. They tell us to just do what they say and we’ll be fixed. The truth is we are perfectly imperfect – that is the human experience. When we clear out the lists and the lectures, we have an opportunity to find love through our imperfections – in ourselves, in our families, and maybe through a thoughtful note from the heart from an honest writer who has the courage to truly open up. 10. They are too long. Just like this list. Enough said. I started writing to share my experiences from an honest, vulnerable place. As Neem Karoli Babba told Ram Dass, “Be honest.” That’s what I want to be. I want to meet my readers at the one place where we are all truly the same, where we understand each other, and where we love each other – in our hearts. So my promise to you is that I won’t cheapen our experience by going for the easy click-through or the surefire strategy. In fact, I intend to do the opposite. I’m set on just being me and sharing my life story from my perspective. My only desire is that you take my experiences and the lessons I learned and apply them in a way that is true and honest for you – not the way I think they should be applied. I hope that we laugh together. I want to share with you in a way that inspires you. I know that we’ll cry a little, too. That’s life. That’s real. And none of this will ever come from a top ten list. Couldn’t agree more. Top 10 lists are invariably generic with no real practical information. They give 10 ‘reminders’ rather than actually sharing a lesson. Uh-oh! I think this is the first time that I’m disagreeing with you…..I love lists!! !